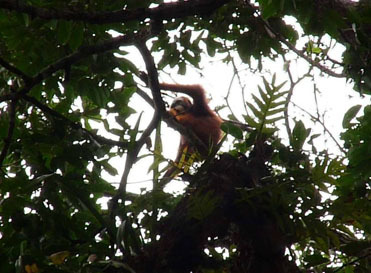 There are several orangutans that we haven’t seen for a while. We know they are around and we get to track them thanks to the transmitters, but we have never met them as they are just too good in avoiding us. 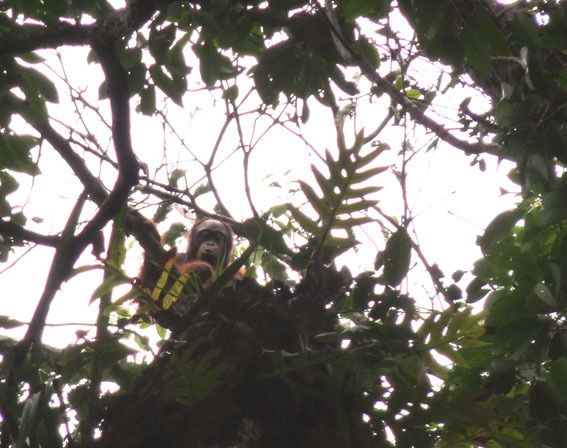 But one day, when Anna and Purnomo were radio-tracking in the area of Gunung Ahmat and were about to climb it to check which orangutans are nearby, we picked up signal of Tata! Tata spotted at Gunung Ahmat! In the past we tried already but never succeeded. We decided to try to find him even though neither of us actually believed we would be able to do so. Surprisingly enough we did find him before he ran away. We saw him for the very first time since the release! He looked very well, didn’t lose weight and he looked happy. But that wouldn’t be the entire truth considering the fact he did not share our excitement about the meeting. The moment he realized that we were close, he became frustrated and was clearly annoyed with our presence. We stayed with him just for half an hour to make sure he was healthy then we left him to enjoy the rest of the day without interruptions. That day, smile didn’t leave our faces and later on we were again lucky enough to pick up 6 other orangutan’s signals from the top of Gunung Ahmat. Our long walk and climbing were highly rewarded this time. It was a very, very good day! Now in Batikap we are all preparing for another 8 orangutans who are going to be released soon. Everyone is excited and we cannot wait to see them returning home!